Why is my house so dusty all the time? I feel like my house is always dusty in spite of how much I vacuum and clean, why? These are very common questions that you’ll see on house cleaning forums. The fact is more than 90 percent of household dust comes from tiny flakes of skin, hair, barely visible fabric fibers, etc… that float on the slightest air current and settle on every surface in your house. Dust is one of those things that requires much patience because it will always seem that soon after dusting and working hard on removing that it all simply returns the very next day. Suction alone with your vacuum cleaner isn’t enough to pull much dust out of your house. For best results, you’ll need an air purifier with a filter that is specially designed for removing dust from the air. Using an air purifier may be the most effective way to keep the air clean and healthy at home. But selecting the best air purifier for dust removal may be one of the hardest jobs since there are too many brands, technologies, and sizes of air purifiers available out there. The easiest way to narrow down your choices is by consulting our picks of the best air purifiers for dust on the market. If you’re considering a new air purifier for dust, this Honeywell 50250-S True HEPA Air Purifier may be what you’re looking for. This is one of the best and cheapest air purifiers that you can buy and it’s extremely effective in capturing dust in the indoor air. That’s probably why it gets such great reviews from both buyers and allergists. To demonstrate why the Honeywell 50250-S is the best option out there to eliminate dust in your home, let’s watch the following video from a user and you can see exactly how much dust this air purifier picked up in a month of running on low setting. The result will blow your mind. If you’re looking for dust removal primarily, look no further than the Honeywell 50250-S. But if you want your new air purifier has more than that and is equipped with more advanced features such as WiFi connection, quiet operation, and energy-efficiency, this Philips Air Purifier 2000i is a great option to buy. This is a smart WiFi air purifier and it has a relatively quiet operation. Why Do I Need an Air Purifier for Dust? If your home is dusty, it can lead to more serious health problems than you think. Household dust contains more than 7,000 species of bacteria and fungi. Your home, like your body, is filled with a vast variety of microbes, many of which live in your household dust. In a study of dust from 1,200 US homes, the dust in each home contained an average of more than 5,000 species of bacteria and 2,000 species of fungi. When you’re exposed to those bacteria and fungi, your health can be adversely affected. Dust is simply another way for the bacteria in your house to reach your body. Your children are of special concern because their developing bodies are more vulnerable to bacteria, and they ingest or inhale more dust than adults since they spend lots of time on or very near the floor. Lead is a highly toxic metal and a very strong poison. Lead poisoning is a serious and sometimes fatal condition. Unfortunately, it’s always sticking around in house dust and you cannot smell or taste lead and it’s not visible to the naked eye. Lead dust can come from anywhere around your house, indoors or outdoors. A simple sanding job can unleash the dangerous dust in your home. If you open the windows while sanding, or sand your home’s outdoor siding, lead dust will travel through the air, coating the soil on your property as well as your neighbor’s. Outdoors, lead dust is found in soil, sandboxes, sidewalks, porch floors, and on swing sets, outdoor toys, and even athletic fields. Easily tracked indoors, lead dust coats floors and blankets, toys and hands, and eventually can wind up in your mouth. Most of the dust in your home is made up of shed human skin cells, which is why the rooms most used in the house generally tend to have the most dust. Dust mites, which are microscopic living organisms, live off of these skin cells – and as dust on mattresses, bedding, and sofas contain lots of skin cells, the dust mites follow. Do you know that nearly every home in North America is contaminated with dust mites? If you suffer from allergies and asthma, dust mites are a major indoor trigger that makes your symptoms worse. According to the American Lung Association, dust mite exposure can even cause asthma. Being exposed to dust mites at home on an ongoing basis can have a dramatic impact on your health. Now you understand why you need to get rid of dust out of your house. Because dust can contain all sorts of things that can affect the health of you or your family members. And as you’re considering buying an air purifier, you obviously care about your health. There is no way to completely eliminate dust, but vacuuming your home regularly and using an air purifier can eliminate up to 95 percent of dust. Using the best air purifiers for dust removal that we suggest in this guide can help trap dust mites, lead dust, and most of the bacteria before they have a chance to settle. Before selecting the best air purifier for dust, first we must understand how an air purifier can help reduce dust in the home. There are two types of air cleaning devices that can help remove dust from the air – high efficiency particulate air (HEPA) filters and electronic air cleaners. HEPA filters remove dust by capturing them on filter materials. 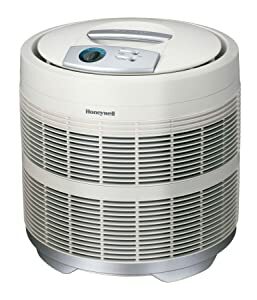 Air purifiers with a HEPA filter, such as the Honeywell 50250-S True HEPA Air Purifier, are effective at capturing dust and other airborne particles such as pollen, some mold spores, and animal dander — and particles that contain dust mite and cockroach allergens. The filter exchanges the air in the room by using a fan to draw the air through the purifier. The impurities remain on the filter leaving pure air to continue on through the machine and re-enter the room. Electronic air cleaners, such as this Aprilaire 5000 Air Cleaner, use a process called electrostatic attraction to trap dust. They draw air through an ionization section where dust obtains an electrical charge. The charged dust then accumulate on a series of flat plates called a collector that is oppositely charged. Ion generators, or ionizers, disperse charged ions into the air, similar to the electronic air cleaners but without a collector. These ions attach to dust in the air, giving them a charge so that they attach to nearby surfaces such as walls or furniture, or attach to one another and settle faster. However, some electronic air cleaners can produce ozone, a lung irritant. The best air purifiers for dust removal are HEPA air purifiers – or air purifiers that have a HEPA filter. Using them in your home can remove most dust and other pollutants. However, the fact is you can find HEPA filters in most modern air purifiers. So it doesn’t make sense to select the best one based on this feature. HEPA filters were designed in the 1940s to protect scientists working on the Manhattan Project from tiny radioactive particles, and due to their efficiency at removing particles from the air they gradually became used commercially in filters and vacuums. A true HEPA filter is rated to capture particles at 0.3 microns in size with 99.97% efficiency, although it can capture both much larger and smaller particles as well. The 0.3-micron size was chosen because it is both the hardest size to trap and the size most easily drawn into lungs. IQAir, one of the biggest air purifier manufacturers from Switzerland, invented the HyperHEPA filter that is up to 100 times more effective than standard HEPA. IQAir’s air purifiers, like this IQAir HealthPro Plus Air Purifier, are able to filter 99.5% of all particles down to 0.003 microns. These are the smallest particles that exist. 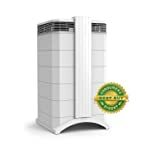 Honeywell is the #1 recommended air purifier brand by Allergists. Captures up to 99.97% of microscopic allergens, 0.3 microns and larger, from the air that passes through the filters. SurroundSeal Technology helps minimize air leaks and ensure that the air passes through the filter. Includes long-lasting HEPA Filter (24000) that can be cleaned. Honeywell is the Number 1 brand of air purifiers that is recommended by physicians as part of an overall allergy treatment program. 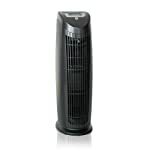 And we think the best air purifier for dust is the Honeywell 50250-S True HEPA Air Purifier. This air purifier is relatively small but is equipped with a mighty engine and a super-efficient HEPA filter that can capture most airborne particles in your room. It also reduces odors, dust mites, mold spores, soot, tobacco smoke, and certain germs. 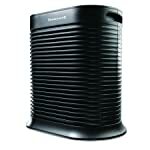 One of the features that makes the Honeywell 50250-S the best air purifier for dust is its patented 360 DEGREE air intake and discharge that maximizes air cleaning and dust capturing efficiency. Its SurroundSeal technology helps prevent the airborne particles circulating through the unit from bypassing the HEPA and leaching back into the room. Since this air purifier can capture a lot of dust in short period of time, the manufacturer recommends that the carbon pre-filter should be replaced every 3 months in order for it to continue cleansing the air and providing a healthy indoor environment. But you don’t have to worry about that as the average cost to replace this pre-filter is just a few dollars. Bear in mind that the Honeywell 50250-S does not reduce or absorb carbon monoxide gas, so if you want your air purifier has this feature, consider the following options. Overall if you’re looking for an air purifier that can eliminate all sorts of dust in your bedroom, living room, or kid’s room, the Honeywell 50250-S True HEPA Air Purifier is the best choice on the market. Honeywell is offering this air purifier on Amazon at a very good price. Perfect for bedrooms, offices, and other rooms up to 500 sq. ft.
With a small footprint design, effective filter, and a lifetime warranty, this Alen T500 Tower Air Purifier is second best air purifier for dust removal. This air purifier is designed for portability, travel, and fitting into tight spaces. It’s simple to use and easy to maintain. Alen T500 Tower offers several options and you can pick the best match for your needs. The model that we’re reviewing here is the model in which the filters are designed to capture dust and allergies primarily. You can also choose another air purifier from Alen for removing bacteria or pet odors if you want. With a 3-speed fan and an intelligent design for airflow maximization, combined with the HEPA filter, this air purifier has the ability to remove dust and allergies in the air quickly and effectively. It runs relatively quiet on low and medium setting but a bit loud on high setting. However in most case the low speed would be enough to create a dust-free environment. The Alen T500 Tower Air Purifier features an LCD panel with intuitive controls, allowing you to adjust settings with just a quick touch of a button. Built for portability, it is easy to carry from room to room and even on trips, blending into the smallest of spaces. To increase customer trust in the performance of Alen air purifiers, the company offers a lifetime warranty on all of its products. However, the warranty is only valid in the US and Mexico. Overall, with so many great features and an effective HEPA filter, the Alen T500 Tower Air Purifier deserves one of the best air purifiers for dust. And with a lifetime warranty, you can’t go wrong with this one. An electronic reminder on the outside of the unit turns itself on when you need to replace the filters. Honeywell added easy to use controls on this unit. You can simply tap the button that you need to turn the air purifier on, set the timer, or make any other adjustments that you need. This air purifier received high CADR marks for the speed and strength at which it removes pollen, dust, and smoke. 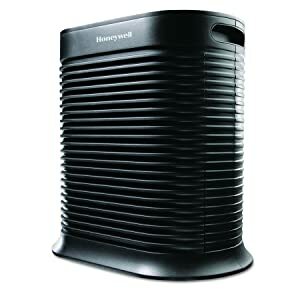 This is another Honeywell air purifier that we think is one of the best air purifiers for dust. As the maximum setting, this Honeywell HPA300 is able to circulate air through the room and pull in new batches of air up to five times each hour. The more times the air passes through the HEPA filter, the cleaner the air becomes. This air purifier is the perfect option to remove dust, dust mites, allergies and even heavy dust that are floating in the air. It also comes with other settings that eliminate odors and remove other toxins. With the Honeywell HPA300, you decide how long you want the air purifier to run. Its timer settings let you run the purifier for 2 hours, 4 hours, or 8 hours. Once it reaches the end of the cycle, the purifier will automatically shut off. 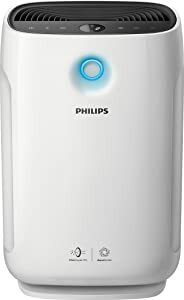 The feature that makes the Philips Air Purifier 2000i one of the best air purifiers for dust is its professional-grade AeraSense technology. AeraSense is a cutting-edge technology exclusive to Philips, the accuracy and performance of which has been benchmarked against a professional sensor. AeraSense continually monitors even the slightest increase in indoor air particles and auto-adjusts the purifier to maintain cleaner air. It gives you real-time feedback on the indoor air quality index via the purifier’s numerical display and color ring, as well as via the connected app. For dust removal, we use the “general” mode. This air purifier also has an extra-sensitive Allergen mode which is ideal for those with high sensitivity to allergens. At the heart of this mode is a unique, always-alert program that detects and reacts to potential allergen risk, and auto-powers the airflow to immediately reduce the allergen exposure. In addition to these auto modes, this air purifier also 5 manual modes. You can choose one of five different settings: from the extra-quiet ‘Sleep’ mode to the extra-powerful ‘Turbo Speed’ mode. Using the ‘Turbo Speed’ mode is the quickest way to eliminate dust in your room. Six purification speeds give you a range of choices for purification speed and noise level. The EvenFlo Diffuser distributes 320 degrees of filtered air at low turbulence and low velocity to prevent uncomfortable drafts. This air purifier is powerful, but it still requires no more electricity than a conventional light bulb. Swiss made, designed for large spaces up to 1,125 square feet. Reigning as the #1 air purifier on the market for allergies and asthma, the IQAir HealthPro Plus Air Purifier scrubs your air clean of a variety of particle allergens and noxious contaminants that trigger your symptoms. It can completely clean the air in your room in just a few minutes, faster than any other air purifier you can find. But as it’s very expensive, you should think twice before deciding to buy this one. At the heart of this air purifier is exclusive IQAir HyperHEPA filtration technology. A dense network of nano-fibers effectively traps particles of all sizes. That includes viruses, pet dander, dust mites, other allergens and even cigarette smoke. While standard HEPA filters are only able to trap particles that are 0.3 microns. IQAir’s HyperHEPA filtration is tested and certified to filter 99.5% of all particles down to 0.003 microns. These are the smallest particles that exist. Imagine the difference virtually allergen-free air can make to your health. The IQAir HealthPro Plus Air Purifier is designed with a four-stage filtration process that cleans the full spectrum of airborne pollutants. Stage 1: Air is drawn in at the bottom of the system and into the pre-filter. The PreMax pre-filter eliminates coarse and fine particles such as pollen, pet dander, and mold spores. Stage 2 and 3: The two-stage V5-Cell gas & odor filter uses dual media to filter a wider spectrum of volatile organic compounds (the cause of odors) and other harmful chemical vapors. Granular activated carbon adsorption and pelletized chemisorption work together to go beyond conventional activated carbon filters found in ordinary air purifiers. 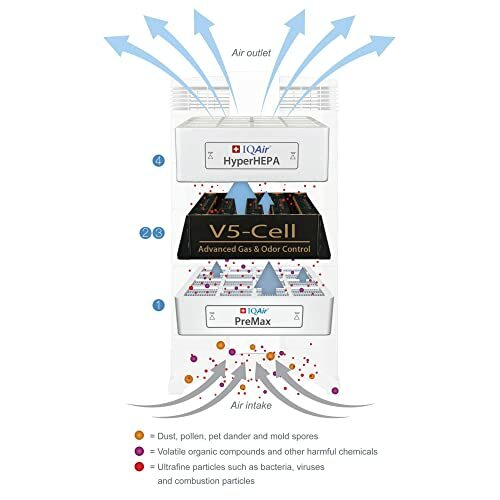 Stage 4: The unequaled IQAir HyperHEPA filter eliminates fine and ultrafine particles, including bacteria, viruses, and highway exhaust particles. The clean air is then expelled through the EvenFlow diffuser and distributed throughout the room. This 4-stage purification system makes the IQAir HealthPro Plus Air Purifier the best air purifier for dust, dust mites, allergens, odors, gases, mold and bacteria in the industry. This air purifier also produces no ozone, ions, chemicals, UV or any other dangerous byproducts. Overall, this air purifier has received more awards than any other, with #1 ratings from Consumers Digest, ConsumerSearch, Parent Tested/Parent Approved, Reviewboard Magazine, Allergy Buyers Club and many more. It’s one of the most expensive air purifiers for dust removal on the market that can cost you up to 3 times as much as other best models, but you get what you pay for. This air purifier will provide you with the very best air cleaner you’ll ever own.